For corporate travellers and holiday makers looking for affordable accommodation in Hobart there is a large selection of fully furnished serviced apartments, hotels, motels and B&Bs to choose from. Because there is just so many properties to choose from it can be a daunting and time consuming task to find the most appropriate property for your specific needs. For this reason lots of people prefer to use the services of an accommodation expert like OzHotels in order to help them find the perfect place to stay. Using this service you can compare lots of different properties that are located right across Hobart, ensuring that you can find the one the meets your requirements and travel budget. The benefits of booking online with OzHotels is that you will be able to book up to 12 months in advance and that you will get an extra discount off the already cheap rates the longer that you stay. St Ives Apartments Hotel Hobart is centrally located in historic Battery Point only a few minutes stroll from Hobart's delightful waterfront and city. This serviced apartment accommodation is set amidst the antique shops, museums and restaurants of Battery Point. St Ives Apartments Hotel Hobart is only two minutes by car to Wrest Point Casino and is a perfect base from which to explore Hobart - for business or pleasure. 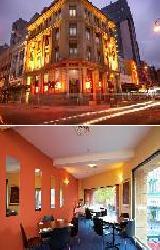 This Hobart hotel / motel offers four star luxury accommodation in Hobart. The Fountainside Motel Hotel Hobart is conveniently located close to the Hobart airport, Hobart City Centre and is only a 40 minute drive from Port Arthur. The rooms in this delightful Hobart hotel / motel comprises spacious and luxuriously appointed motel suites, set in a beautiful setting, equipped with all the facilities required to ensure a very pleasant stay. The Restaurant and Bar, with its quaint atmosphere offers a superb international a la carte dining experience - and is open 24 hours a day. 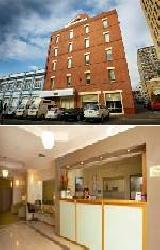 The Midcity Hotel Hobart offers accommodation right in the heart of the Hobart CBD. The Midcity hotel is just a short stroll to the popular ethnic eateries of North Hobart or to Salamanca Place and the wonderful Sullivans Cove waterfront area with its seafood and modern cuisine restaurants. The Midcity Hotel Hobart offers a range of accommodation rooms over five floors, all accessible by lifts and affording great views across Hobart and towards Mount Wellington. The Mid City Hobart Bar & Cafe and the Oasis Gaming Lounge are open all day for your enjoyment. The hotel central location is perfect for day excursions into Tasmania's superb southern touring regions, or for shorter excursions into Hobart's great shopping and dining precincts. The Zero Davey Apartments Hobart offers studio, 2 & 3 bedroom serviced apartments right on the beautiful Hobart waterfront. With a buzz that will draw lovers of modern style the Zero Davey Apartments central location in the historic port of Hobart combined with its contemporary and stylish appointed accommodation makes it the hippest place to stay in Hobart. The effervescent staff at the Zero Davey's boutique Hobart apartments will be more than happy to point you in the direction of some of Hobart's finest cafes, restaurants and galleries, while the Hobart CBD and Salamanca Markets are right on the doorstep of the property. All of the luxury accommodation apartments are equipped with plasma screen TV's, some with spa baths, kitchen/kitchenette, wireless broadband internet access and laundry facilities. The Zero Davey Boutique Apartments Hobart also boasts a sauna, mini-gymnasium, secure undercover car parking and lift access. 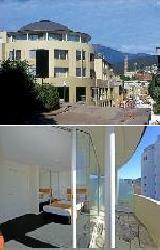 At the Somerset on the Pier Apartments you can stay right on the water in Hobart's only waterfront serviced apartments. The Somerset on the Pier's serviced apartments offer both business and leisure travellers a chance to experience quality Hobart accommodation in a superb waterfront location. Somerset on the Pier is an award winning transformation of the early 1930s pier building and offers guests breathtaking views of the River Derwent and Historic Sullivan's Cove. These quality apartments in Hobart are conveniently located just a few minutes walk from Salamanca Place, Battery Point and the Central Business District. Guests can enjoy the city's finest restaurants and cafes, local galleries and craft shops, while exploring the natural beauty and charm of this historic city. Somerset on the Pier offers spacious and luxurious Hobart accommodation that is more like a home than a hotel. 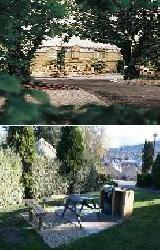 The Grosvenor Court Apartments Hobart are ideally situated in the quiet and peaceful Hobart suburb of Sandy Bay. Only a short walk from the Grosvenor Court Apartments is the Sandy Bay beach and the Plaza shopping centre with it's numerous restaurants and shops, including a supermarket open until midnight. 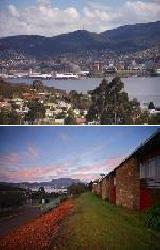 Grosvenor Court offers affordable, discount studio and 2 bedroom apartment accommodation in a great Hobart location. These fully self contained Hobart apartments provide the ideal place to stay from which to explore all of the attractions that Hobart and southern Tasmania are famous for, including the Salamanca Market, Cadbury Chocolate Factory, historic Port Arthur, Huon Valley Trail and Tahune Air Walk. Travellers searching for apartments in Hobart will enjoy staying at Somerset on Salamanca. These secure and spacious serviced apartments are a welcome alternative to a hotel for the busy corporate executive or family on vacation or relocation. Situated just minutes from the Central Business District and the Salamanca Market this Hobart accommodation allows guests to simply stroll to an abundance of business and recreational activities. Guests staying at the Somerset on Salamanca Apartments can experience the unique city of Hobart while also being able to relax in these fully self contained business apartments in Hobart which comes complete with it's own private balcony or courtyard, contemporary decor and modern fittings. 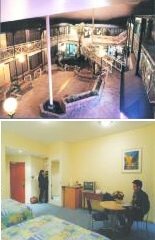 The Old Woolstore Apartments Hotel Hobart, provides real country-style hospitality. This Hobart luxury serviced apartment hotel is situated right in the heart of Hobart's CBD and provides the perfect accommodation for the corporate or leisure traveller. The friendly staff at the Old Woolstore Hotel Hobart have been hand picked to ensure that you will receive the best of service at all times. Behind our historic facade you will discover a modern and vibrant apartment hotel, widely regarded as one of the finest hotels in Hobart. The Rydges Hotel offers boutique Hobart CBD accommodation where the charm and grace of the olden times is in perfect harmony with the modern facilities of today. 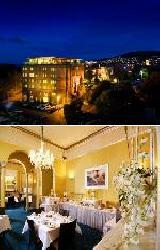 Rydges Hobart is a heritage listed building which capture the essence of the historic city of Hobart. This special accommodation in Hobart is quietly sophisticated and imbued with a warmth and intimacy that only a small boutique property can offer. Rydges Hotel Hobart features excellent guest facilities such as high speed wireless and wired internet, outdoor swimming pool, sauna, licensed restaurant, bar and cafe, eight ball table, Austar in all suites and apartments, 24 hour reception and FREE parking. Offering a lush garden setting and genuine, enthusiastic service only minutes from the CBD, the Rydges Hotel provides the perfect base for exploring this city's spectacular sights. Mt Wellington, the Huon Valley and Constitution Dock are just a few of the many attractions on offer in Southern Tasmania. The Quest Waterfront is the best value apartments in Hobart. perfectly located in Historic Sullivan's Cove, Quest Waterfront offers quality hotel rooms and apartments that are just a stone's throw from Hobart's thriving waterfront and a short stroll from the Hobart CBD. Ideal for either leisure or business travellers, the Quest Waterfront Apartment Hotel is only meters from numerous cafe's, restaurants, bars, shops and the renowned Salamanca Place and it's famous market. 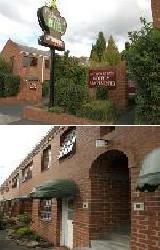 All business and tourist attractions are within easy reach of this Hobart apartment accommodation. The Quest Waterfront is the ideal base from which to explore southern Tasmania and it also includes an extensive range of luxury Quest Services such as daily room servicing, valet dry-cleaning, babysitting service, airport shuttle, concierge, Broadband wireless internet and the gym, pool, spa and sauna facilities close by at The Hobart Aquatics Centre. The generous dimensions of the apartments provide guests with the ability to work privately in an environment more conducive to business requirements than a standard hotel room. Harringtons 102 is an ultra modern Hobart property that is ideal for the tourist because it is located in Hobart's central business district with easy access to the city and all major tourist attractions. Featuring modern comfortable standard hotel rooms and suites the Harringtons 102 is truly unique with all rooms being equipped with Persian Marble ensuite bathrooms. This budget Hobart accommodation is an inexpensive base from which you can visit all of the delights of southern Tasmania. The newly opened Hotel Collins is Hobart's newest luxury property positioned in the heart of the CBD and overlooking the Hobart waterfront. With views of Mount Wellington and a location within close proximity to the Theatre Royal, Royal Hobart Hospital, Constitution Dock and Salamanca Place this Hobart accommodation will enhance your Tasmanian work or holiday experience. 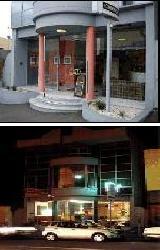 The Hotel Collins offers contemporary, comfortable hotel rooms as well as 1 & 2 bedroom self contained apartments. All guest rooms are non smoking and features stylish, modern furnishings. This Hobart accommodation also offers many other facilities to suit the discerning corporate or leisure guest including cafe bar, free wireless internet connection, guest laundry, business centre, daily housekeeping, in-house movies, tour desk and room service. Apartments at Woolmers is ideally situated in the charming harbourside suburb of Sandy Bay. Situated close to the excitement of Wrest point Casino and five minutes drive to historic Battery Point, the Hobart CBD, Salamanca Market and Sullivan's Cove this discount Hobart accommodation is great for corporate clients, family groups and couples. With a range of spacious, modern studio apartments, two bedroom villas and two bedroom apartments the Apartments at Woolmers has something for everyone. The waterfront and it's many restaurants are also close by to this affordable Hobart apartment complex. Woolmers Inn gives you the flexibility to relax in your spacious apartment in a stress free and comfortable environment. There is also free off-street car parking at the Leisure Inn Woolmers Apartments to ensure your maximum convenience and safety. The unique serviced apartments in Hobart's Quest Trinity House ranges from discount studio apartments right through to spacious 1, 2 & even 4 bedroom self contained apartments. Ideally located in Hobart's city fringe only a 5 minute stroll from the CBD, Hobart's Waterfront, Salamanca Place, North Hobart restaurant precinct and sporting venues. Quest Trinity Serviced Apartments offers superbly appointed and spacious serviced apartments set in an expansive garden setting with lovely established deciduous and evergreen trees, make the property a uniquely special and peaceful destination. Quest Trinity House is a fantastic alternative to traditional Hobart accommodation offering guests a spacious apartment for the price of a hotel or motel room. Quest Trinity House includes quality guest facilities such as free car parking, extensive landscaped garden with BBQ facilities, mini bars, room service, chargeback facilities at selected restaurants, babysitting service, laundry & dry cleaning service and tour desk. Offering a fascinating ambience, picturesque location and a a fine blend of tranquility, Quest Trinity House provides easy accessibility to the city centre, waterfront and all of Southern Tasmania's major tourist attractions. The Blue Hills Motel is ideally situated in Sandy Bay Hobart, within easy walking distance of a variety of local restaurants and shops as well as many key attractions in the city. 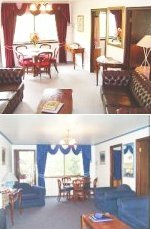 Guests at the Blue Hills Apartment Motel can choose from either queen and twin hotel rooms or 1 bedroom and cottage style apartments. 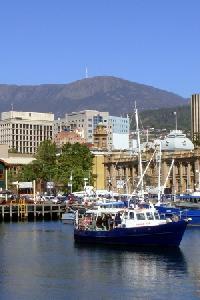 You can spend a day at Hobart's famous Waterfront or visit the Botanical Gardens, just two kilometers away. Hotel guests will also enjoy attractions such as Mount Wellington, Wrest Point Casino, the Salamanca Markets and the Historic Battery Point. The Blue Hills Motel also provides convenient access to local events such as Taste of Tasmania, the Sydney to Hobart Yacht Race and the Wooden Boat Festival. The friendly, helpful staff at the Blue Hills Motel are ready to ensure a fun-filled memorable stay in Hobart, Tasmania. Salamanca Terraces is ideally located in picturesque Sullivan's Cove waterfront precinct of Hobart, adjacent to the historic Battery Point. This quality Hobart property offers the choice of studio, 1 & 2 bedroom self contained serviced apartments that are right next to the famous Salamanca Markets. 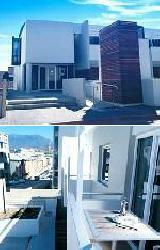 The Salamanca Terraces provides all types of travellers with discount accommodation in Salamanca Place. It also features a wide range of modern amenities and services such as lounge bar, conference centre, internet access, free car parking, lift, restaurant, room service, tour desk, garden area, airport shuttle, 24 hour reception, babysitting service and daily housekeeping. All of this makes Salamanca Terraces the ideal accommodation in Hobart for business travellers and leisure guests on extended stays. 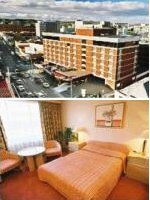 The Waratah Hotel offers a clean, comfortable and affordable place to stay in the heart of the vibrant Hobart CBD within easy reach of the many Hobart attractions. 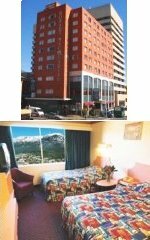 This delightful, modern and spacious hotel is ideal for the budget conscious backpacker looking for hostel accommodation with extra privacy & luxury, holiday makers looking for centrally located B&B accommodation in Hobart & corporate business traveller requiring an affordable place to stay in the heart of the city centre. The Waratah Hotel features a wide range of modern amenities and services such as lounge bar, direct internet access, free car parking, guest laundry, restaurant and daily housekeeping. The Waratah Hotel also includes a free, hot cooked breakfast each morning, which is a great way to start the day. 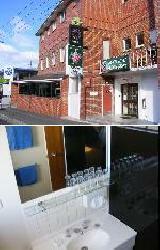 The City View Motel is the perfect location for your next visit to Hobart. This discount Hobart accommodation offers a selection of well appointed, non smoking motel rooms to suit every budget including double or twin hotel rooms and larger family hotel rooms. The City View Motel is situated in Montagu Bay which is only five minutes from the Hobart city centre and Salamanca Markets as well as 15 minutes to the Hobart Airport by car. This Hobart accommodation provides the ideal base from which to take day trips to southern Tasmania's major tourist attractions including the Huon Valley, Tahune Air Walk, historic Port Arthur and Richmond townships. The Possum Apartments Hobart provides holiday makers and business travellers with a selection of self contained studio apartments that are ideally nestled in a secluded bush setting in Lindisfarne. With spectacular views of Tasman Bridge, Derwent River and the Hobart city skyline the Possums Apartments Hobart are located close to the Hobart city on Hobart's Eastern Shore and are central to all tourist attractions. The Possums Apartments provides all types of travellers with discount accommodation in Lindisfarne. It also features a wide range of modern amenities and services such as free car parking, tour desk, bbq facilities, a landscaped garden, free cots and free breakfast provisions in your room for the first morning of your stay. 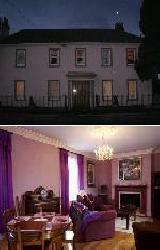 The Possum Apartments offers the ultimate relaxation in Hobart so why not stay here on your next trip to Tasmania. If you are looking for cheap, value for money Hobart accommodation then the Waterfront Lodge Motel is definitely the place for you. With a range of stylish hotel rooms and studio apartments available the Leisure Inn Waterfront has something for everyone. 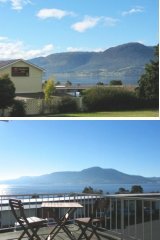 Positioned in a fantastic, absolute waterfront position in New Town Bay with great views of Mt Wellington and the Derwent River the Waterfront Lodge Motel is just 4 minutes travel to the city centre, Salamanca Market, Battery Point, Sullivan's Cove and the nightlife entertainment at Wrest Point Casino. This non smoking New Town accommodation features free car parking, guest laundry, tour desk, outdoor swimming pool and barbeque entertainment area. 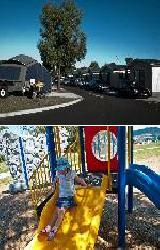 This makes it the ideal base from which to explore all of the many tourist attractions in southern Tasmania. The Lenna of Hobart is a heritage hotel offering first class Queen Hotel Rooms, King Suites & luxurious 2 Bedroom 2 Bathroom Penthouses located in in the heart of historic Battery Point amidst the colour of Sullivans Cove, just a stone's throw from fashionable Salamanca Place and the Hobart city centre. 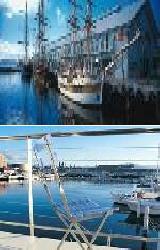 The Lenna of Hobart provides all types of travellers with discount accommodation in Salamanca Place. It also features a wide range of modern amenities and services such as lounge bar, business centre, conference centre, direct internet access, faxing facilities, free car parking, guest laundry, lift, restaurant, room service, tour desk, garden, airport shuttle, 24 hour reception and daily housekeeping. Situated on Salamanca Place and overlooking Hobart's picturesque waterfront and the many lifestyle attractions, including markets, craft shops, cafes, restaurants, art galleries and the historic precinct of Battery Point, Lenna Penthouses are ideally located to experience the cultural essence and vibrancy of Hobart. The Graham Apartments offers all types of travellers the choice of smaller studio apartments or larger fully self contained one, two and three bedrooom apartment. 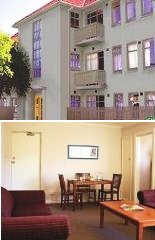 This great value Hobart apartments are beautifully maintained and even includes Spa apartments in which you can indulge yourself with a quiet, relaxing night in. The Graham Apartments has delightful gardens featuring century old elm and oak trees as well as hotel facilities such as a huge playground area for children, guest laundry, dry cleaning service, tour desk, barbecue facilities and free off street car parking. This spacious Hobart accommodation is located in the older suburb of New Town, which is an elegant leafy residential suburb providing a peaceful haven only minutes from the city centre and waterfront. Close by to the Graham Apartments is the vibrant North Hobart restaurant strip and public transport to sporting venues, shopping, theatres, hospitals and function centres. The Quest Savoy Apartments is a truly unrivalled property which is located in the heart of all that Hobart has to offer. Quest Savoy's Hobart accommodation is in the heart of the CBD adjacent to the shopping mall and only metres to the historic and vibrant waterfront and Salamanca Place which features a wide slection of restaurants, cafes and galleries. Guests choosing to stay at the Quest Savoy can choose from either a range of studio suites or fully self contained 1 bedroom apartments, all featuring soft European furnishings, spacious living and dining areas. 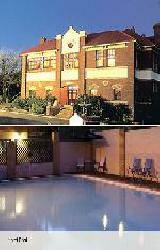 This quality Hobart accommodation also showcases the 'Savoy Baths', which is Hobart's only comprehensive therapeutic baths with heated salt pool, spas, steam room, sauna, massage and treatment facilities. Quest Savoy offers all the space and comfort of your home together with an extensive range of Quest Services. 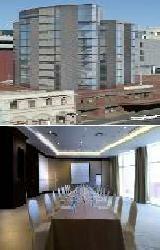 Centrally located for the business traveller with easy access to all the city offices. For the holiday traveller, Quest Savoy is ideally located with close access to some of Hobart's premier tourist attractions and shopping. Quest Savoy Apartments are also an excellent base from which to explore Hobart's waterfront areas, Historic Battery Point, Royal Botanical Gardens, museums or a day trip to Port Arthur, Richmond, The Huon Valley, Tahune Airwalk, wineries or Russell Falls. The Mona Pavillions is a luxurious property that offers guests 8 contemporary 1 and 2 Bedroom 2 Bathroom Apartments that are dedicated to different artists. All of the rooms featured their works in the apartments and are ideally located in the acclaimed Moorilla Winery overlooking the Derwent River, a mere 15 minutes drive from Hobart. 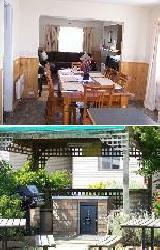 The Mona Pavilions provides all types of travellers with discount accommodation in Berriedale and features a wide range of modern amenities and services such as lounge bar, conference centre, direct internet access, faxing facilities, free car parking, guest laundry, restaurant, spa, tour desk, garden and indoor swimming pool. You even get access to the MONA Collection (Museum of Old and New Art) featuring impressive works of art. So stay at the Mona Pavillions and savour art and breath taking scenery from the comfort of your own luxurious apartment. The Hobart Cabins and Cottages are set in a tranquil garden setting which is ideal for families and provides you with all the splendor of modern living at affordable prices. These self contained Hobart cabins, cottages and holiday homes have been recently refurbished and are conveniently situated on 3 acres of magnificent gardens. The Hobart Cabins and Cottages are in central Hobart, just nine minutes from the Hobart CBD and Salamanca Market and only five minutes from the popular Cadbury Chocolate Factory. A short five minute walk will also get you to the entertainment centre, a major supermarket, shopping center, Olympic swimming pool, village cinemas and restaurants. 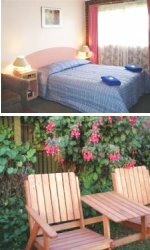 The Hobart Cabins and Cottages provide you with clean, comfortable cottage accommodation in Glenorchy with a range of facilities including free car parking, free cot hire, guest laundry, tour desk, BBQ facilities, internet access, games room, children's playground, DVD and video hire. VisitHobart.com.au is a directory for hotels, motels and apartments in Hobart, On one click, you can access to cheap internet rate, discount rate luxury or affordable Hobart hotels, motels and apartments. All accommodation are closely located to public transport, and hobart's major attractions such as the Royal Tasmanian Botanical Gardens, Allport Library and Museum of Fine Arts, Old Hobart Town Historical Model Village, Bonorong Wildlife centre brighton, Esperance Forest and Heritage Centre. Perfect for an intimate escape, romantic getaway or holiday retreat the Maison del Mar is housed within one of Hobart's gracious old waterfront homes, lending an air of charm about your stay. Maison del Mar offers absolutely delightful 2 bedroom apartment accommodation in Sandy Bay, which is one of Hobart's most desirable residential areas. The rooms at the Maison del Mar are very well appointed, comfortable and spacious. They have also been newly renovated and are tastefully decorated with a nice blend of antique and modern and original art works. This charming Hobart property is ideally situated in a perfect location with beach at back door, bus stop at front door, a gourmet delicatessen across road, excellent restaurants, university, casino and city close by. The Maison del Mar is an excellent base from which to explore Hobart and all of the tourist attractions of Southern Tasmania. Mayfair Plaza Motel Hobart provides unique accommodation set in a small business complex. Enjoy a browse along the Sandy Bay Road shops and afterwards enjoy a light snack or coffee at one of the many cafes or restaurants in the area. Travellers requiring the finest in accommodation enjoy a flexible mix of well appointed 4 star spacious and superior quality rooms. All the rooms have air-conditioning / heating, tea & coffee facilities, hairdryers, mini bar, are non-smoking, have direct dial room phones and free cable TV. We also offer laundry facilities, free off street and undercover parking, ramp access to all areas and there are a number of restaurants and cafes in the complex. Just minutes away from the Wrest Point Casino and Convention Centre, Salamanca market, historic Battery Point, Hobart CBD and yacht clubs, the Mayfair Plaza Motel Hobart is an ideal base from which to explore the exciting atmosphere of southern Tasmania. The Hobart Airport Tourist Park is well positioned to take advantage of the Hobart International Airport, which is just 4 minutes away, as well as the Hobart CBD which is only 15 minutes drive. With a variety of self-contained 2 bedroom chalet accommodation including transfers to the airport and Hobart CBD, the Hobart Airport Tourist Park is an ideal base from which to explore Southern Tasmania's renowned attractions including Sullivans Cove, Salamanca Markets, Richmond and Port Arthur. 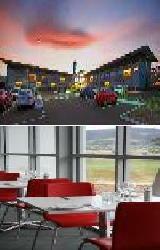 The Hobart Airport Tourist Park provides all types of travellers with discount accommodation in Hobart Airport. 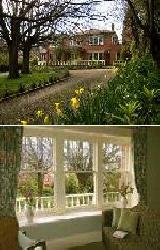 It also features a wide range of modern amenities and services such as disabled facilities, faxing facilities, free car parking, guest laundry, restaurant, tour desk, bbq facilities, airport shuttle, free cot hire, lounge bar, children's playground, communal kitchen, internet kiosk, petrol station, on site convenience store, newspapers, luggage storage and car hire. The Motel 429 Hobart is located just across the road from Hobart's Wrest Point Casino, overlooking the magnificent Derwent River in the Sandy Bay area of Hobart. This affordable Hobart motel is within minutes of the Hobart city centre and provides the ideal base from which to discovering the delights of southern Tasmania. Guests staying at the Motel 429 can relax and enjoy a spa, sauna and perhaps a workout in the gymnasium as well as being able to fully appreciate the contemporary design and modern conveniences that each of the motel rooms possess, including self-controlled heating, direct dial phone, mini bar, electric blankets, complimentary tea and coffee and in-house movies. Some of the motel rooms at this quality Hobart accommodation even include water views overlooking the beautiful river Derwent. Hobart Apartments is the ideal base while visiting and exploring all that Hobart and Tasmania has to offer. Located in Lutana only a short drive from Hobart CBD, Hobart Apartments provides fully self contained apartments whilst you enjoy all the sights and attractions that Hobart and the surrounding areas have to offer. Only minutes drive to Salamanca Market, Cadburys Chocolate Factory, the Waterfront district and Wineries. Our spacious apartments provide the ideal accommodation for long or short term stays whilst visiting Tasmania. The Travelodge Hobart Airport Hotel offers quality accommodation next to the Hobart Airport, making it ideal for corporate travellers, leisure guests, groups and families. The Travelodge Hobart Airport Hotel has a range of affordable hotel rooms, as well as self contained 1 & 2 bedroom serviced apartments that include numerous in-room facilities to make your stay more comfortable, such as double glazed windows. It is conveniently located at the Hobart International Airport and only 15 minutes from the Hobart CBD and the famous waterfront precinct of Salamanca. Guests can use the Hobart Airport Hotel as the perfect base from which to explore Southern Tasmania's main tourist attractions including the historic townships of Richmond and Port Arthur. The Hobart Airport Hotel offers an excellent range of guest faciilities including a fully licensed restaurant and cafe, room service, Free shuttle service to and from all flights, daily housekeeping, guest laundry, tour desk, high speed internet access and Free car parking. If you are looking for budget hotel accommodation right in the heart of the Hobart CBD then look no further than the Travelodge Hobart. This central Hobart hotel is ideal for budget conscious travellers, corporate business people, school and sporting groups and families looking for an affordable holiday in Hobart. Located in the CBD the Hobart Macquarie Hotel is within easy walking distance of many restaurants, shops, cafes and most of Hobart's major tourist attractions. 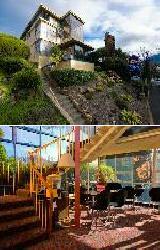 Clean, comfortable and refurbished the Hobart Macquarie Hotel has excellent discount rates available online. Bay View Villas Apartments is located in quiet and picturesque West Hobart just minutes from the CBD and all local attractions. Bay View Villas offers quality two or three bedroom, fully self-contained double storey apartment accommodation in Hobart. 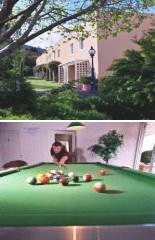 Bay View Villas Hobart is ideal for families or groups, offering a wide range of facilities including games room, heated indoor swimming pool, children's playground and BBQ area. 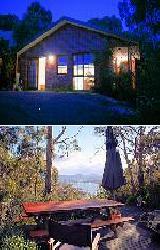 We offer the perfect base from which visitors can experience the magnificence of Southern Tasmania. The Martin Cash Motel Hobart offers an affordable place to stay for everybody with it's ensuite motel style rooms being perfect for holiday travellers, corporates business guests, trades people and families. Providing great service and a comfortable homely feeling the Martin Cash Motel's great staff will take good care of you. The Martin Cash Motel provides great value discount Hobart accommodation conveniently located only 5 minutes drive from the Cadbury Chocolate Factory, Derwent Entertainment Centre, Elwick Show Grounds and Racecourse, Village Cinema and Moorilla Estate Winery. Also the Hobart CBD, the docks and Salamanca are only a 10 minute drive away and there are numerous restaurants and take away food outlets within walking distance from the Martin Cash Motel Hobart. The Riverfront Motel Hobart provides excellent value motel rooms in Hobart with various styles of rooms ranging from great value standard motel rooms, fantastic river view motel rooms and spacious family motel rooms. The Riverfront Motel Hobart is ideally positioned on the banks of the Derwent River at Berriedale with the picturesque Mt Wellington as a backdrop to this budget Hobart accommodation. The Riverfront Motel Hobart has the major advantage of being within a 10 minute radius of Hobart's top attractions including the city centre, Battery Point, Salamanca Place, Wrest Point Casino and within a few minutes drive from the Moorilla Winery, Cadbury Chocolate Factory and the Derwent Entertainment Centre. At the Riverfront Motel Hobart guests can even spoil themselves at the superb restaurant & bar which is open 7 days for breakfast & dinner. The Tasmanian city of Hobart and the surrounding region has many different places that are ideal for long or short term stays. This includes the Henry Jones Art Hotel Hobart, Clydesdale Manor Hotel, Colville Cottage Hobart, Hotel Grand Chancellor Hobart, Flinders Lane Holiday Apartments, Clarion Hotel Wrest Point Casino and Beltana Hotel Hobart. In order to book in at these or any of the other hotel accommodation in Hobart then click here to make an enquiry.